From left are Professor Sung You Hong, Jae Bin Lee, Mi Eun Kang, Woo Gyum Kim, Professor Jan-Uwe Rohde, and Jungha Lee. Their research findings, published in the August issue of the Journal of the American Chemical Society. A recent study, affiliated with UNIST has presented a new way to advance the click chemistry. This is expected to be used in various areas, such as the synthetic chemistry of new drugs, development of functional high-molecules, and bio-imaging. This study has been led by Professor Sung You Hong in the School of Energy and Chemical Engineering at UNIST in collaboration with Dr. Gonçalo J. L. Bernardes’ group at University of Cambridge, Professor Sebyung Kang in the School of Life Sciences, as well as Professor Jung-Min Kee, Professor Jan-Uwe Rohde and Professor Wonyoung Choe in the School of Natural Science at UNIST. The comparison of the existing synthesis method and the newly developed synthesis method by Professor Hong. “The NiAAC reaction is performed under the mild reaction conditions. Therefore this approach can be applied in various research fields including chemical biology and materials science,” says Woo Gyum Kim in the Combined M.S/Ph.D. of Energy and Chemical Engineering, the first author of the study. This study has been supported by the National Research Foundation of Korea (NRF), IT R&D program of MOTIE/KEIT, and UNIST fund. This NiAAC reaction was published in the August issue of the Journal of the American Chemical Society. 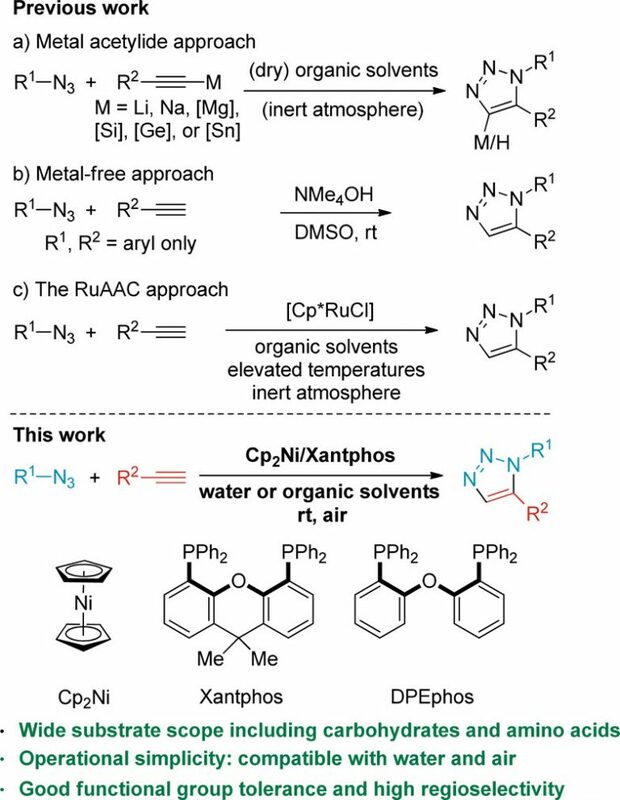 Woo Gyum Kim, et al., “Nickel-Catalyzed Azide–Alkyne Cycloaddition To Access 1,5-Disubstituted 1,2,3-Triazoles in Air and Water,” JACS (2017).